Any toy that can encourage a child to help with household chores is a good toy in my opinion. Add quality wooden construction, and I am sold! Magic Cabin offers a Child’s Cleaning Set that contains real cleaning tools. 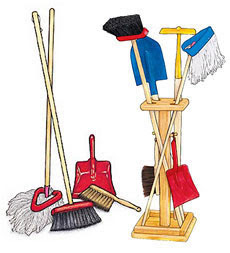 The set includes a metal dustpan and broom, string mop, and a broom; all child-sized! I have heard parents exclaim in dismay that their child is “wasting time cleaning in her new Montessori school when she should be doing math!” However, math and all other intellectual work requires the ability to move carefully, to focus, to complete sequential steps, to concentrate, to make intelligent choices and to persevere in one’s work. This is exactly what is learned during practical life work. As a result of periods of time spent concentrating on such a task a child becomes calm and satisfied and, because of this inner peace, full of love for others. Perhaps an even more important result of this work is that the child sees himself already as an important and contributing member of the group, and as an intimate friend, when he is welcome to participate in the work of the adult. Magic Cabin’s Child’s Cleaning Set is made in the Netherlands, so no need to worry about Chinese manufactured goods with this purchase. The optional tool stand is made in the USA. With the holidays approaching, the Child’s Cleaning Set would make a great, practical gift. Nice article. Some of my favorite childhood memories are when I was “helping” Mom and Dad with my own child-sized tools (leaf rake, broom, wheelbarrow). I would sweep the cement driveway for hours and rake and rake and rake–even when there were no leaves! Another great source for cleaning materials is Montessori Services. “For Small Hands” is their catalog for families http://www.forsmallhands.com . It has child-size everything!